Mika Stillwater is a mid-level earth elemental with ambitions of becoming a quartz artisan, and her hard work is starting to get noticed. 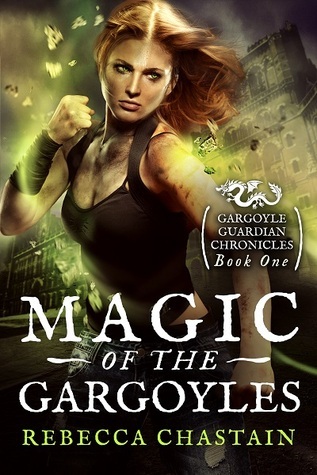 But when a panicked baby gargoyle bursts into her studio, insisting Mika is the only person she’ll trust with her desperate mission, Mika’s carefully constructed five-year plan is shattered. I honestly really love this author's writing style. Yes, she writes fantasy books, but there is something she does when she writes that makes the story feel so real and alive. The author has such a way of making you feel like you are there in the story. Now, this story follows Mika who has some powers, but she wants to have some sort of normal life. She has a 5-year plan and she plans on keeping it. However, things go whacky and she is sucked into the paranormal world to help this gargoyle. Mika was okay. I connected with her on some points, but I felt distant from her. She was super whiny and I get that she wanted something of a normal life, but meh. You have powers that can do real good...use them. Maybe this short-ish story was too short so I didn't really get a chance to connect with her and see her grow some more into her role? Not sure, but I just had a hard time with Mika. The rest of the cast was forgettable, unfortunately. I did really like the gargoyles and I want to learn more about these creatures. They were interesting and cuteeeee. The baddie was a monster for sure, but very predictable in my opinion. The story and adventure was fun, but it did take a long time to get sucked in compared to the author's previous stories. It is not that it was a slow beginning, but I felt it was too quick and I was confused the majority of the time. Once things made sense I got into the adventure. I wouldn't mind reading the next one if it was free or at the library. I'm hoping I can connect with the star of the show more so in the next one. This was just okay. I'm a little bummed because it wasn't as good as the past books I have read. I'm going to give this a 2. Melliane, can't win them all I guess. B, free is free though.